LED bulbs seem to be the best way to save energy and money when lighting an area of your home. LED bulbs last much longer….up to 20-30 years longer than regular light bulbs. A major complaint I have had with LED bulbs is that they are harsh or too bright. But, I was pleasantly surprised by the VIVID Lighting Sample Pack I received to try. Even though they are a 60 Watt bulb, each one only uses 8 Watts of energy. I received an LED Soft White bulb and an LED Daylight bulb. I also liked that the bulbs looked like normal bulbs and not the spiral shape that a lot of LED bulbs look like. When you are changing them out in an overhead light, they look like regular bulbs. 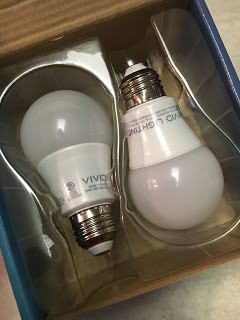 My husband was anxious to try these bulbs in the garage. Even though I was thinking of using them in another room, I gave in since most of the products I get to try are for me. Our garage is really dark and the lights are on a lot because someone is usually going in and out of there all day long. 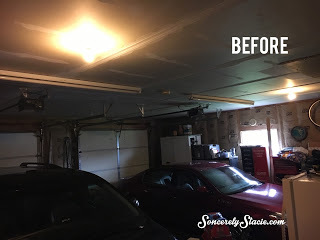 So, we were hoping these bulbs would make a big difference in our garage lighting. Since they also last longer, that adds another benefit because it’s a pain to change the bulbs in the garage. 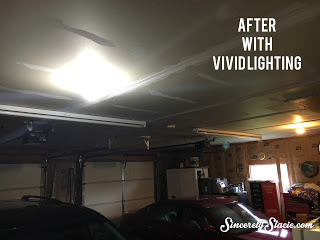 As you can see, between the before photo and after photo, the lighting is quite different. It is definitely brighter. These photos were taken just minutes apart. The outside lighting hadn’t changed (we only have that one small window) and I think you can really tell a difference in the amount of bright light these bulbs put out. For around $20, you can get a 6-pack of either the LED Soft White or LED Daylight bulbs. That will cost you roughly $1/year for each bulb. That is an amazing deal. 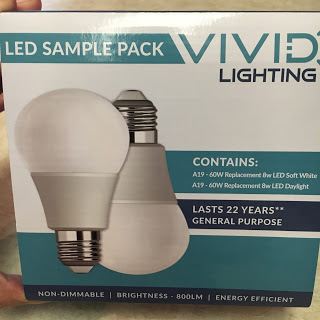 Thanks to VIVID Lighting for sending this product for the purpose of this review. This review is my honest opinion. I was not compensated in any way for this review. If you choose to purchase the product through the above links, I may receive a small commission without you having to pay a cent more for your purchase. Thanks for supporting SincerelyStacie.com.